Sharing another recipe that will make dads happy this Father’s Day. 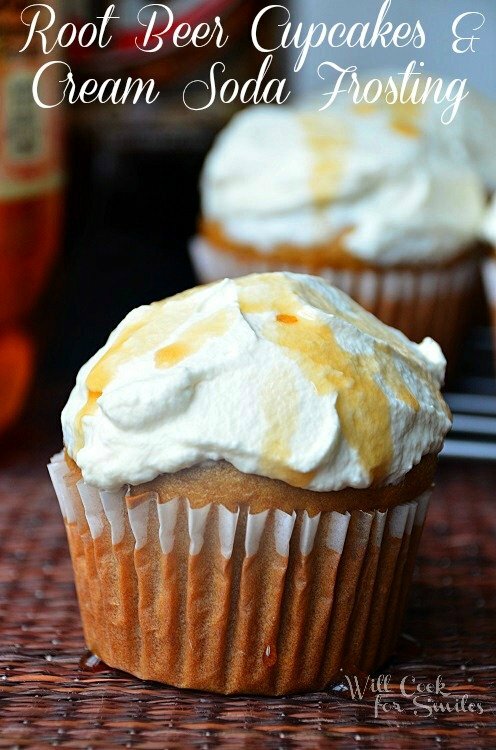 Root Beer Cupcakes with Cream Soda Frosting! 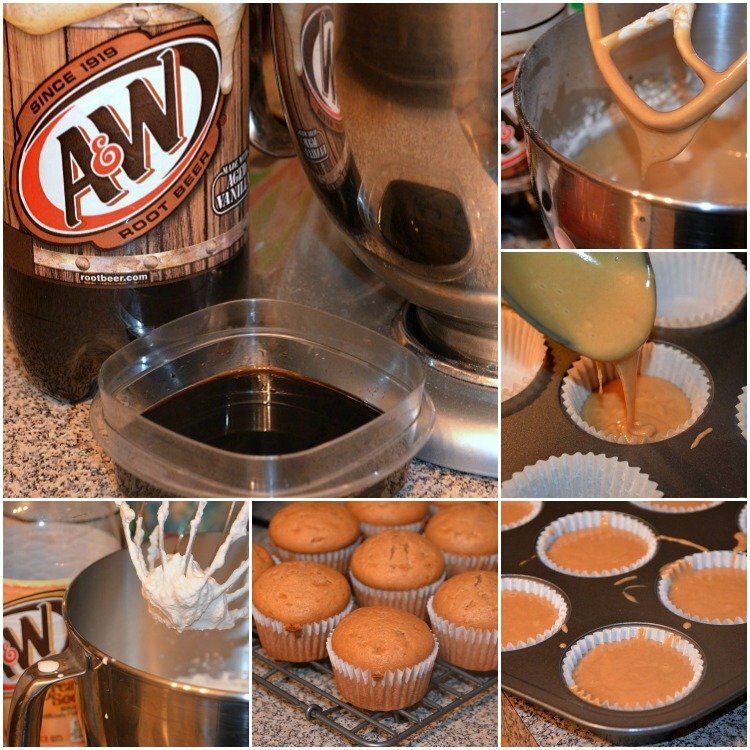 Delicious cupcakes made with a reduction of root beer for a stronger flavor and topped with whipped frosting flavored with a reduction of cream soda. These two flavors compliment each other very nicely. If you are following me on Facebook, you will remember our discussion about these cupcakes. Last week, I asked my husband what are some dishes that men would like to have on Father’s Day. Once we got passed all the bacon, we talked about dessert ideas. He is not a huge fan of bacon in desserts, I am a little scared of those too, so we went another way. 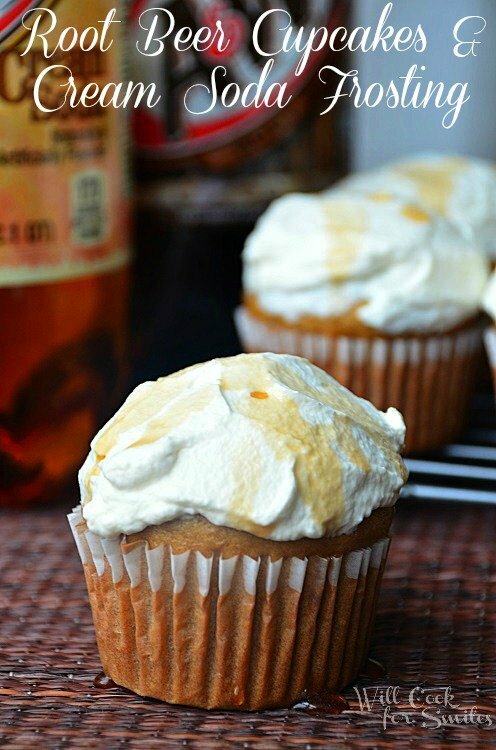 Since he loves root beer and cream soda, he proposed this cupcake idea. At first, I was a little unsure about the combination of flavors. So I took it to Facebook to see what my fans thought. The response was amazing, most of the readers loved the idea! Soooo, by popular demand, here are the Root Beer Cupcakes with Cream Soda Frosting! After checking three stores, I didn’t find root beer extract. Although, I can’t say I was too upset because I don’t bake much with it and it would be a waste. I decided to go another way. Something I learned a while ago, making my Cherry Cake Roll, is to use reduced soda syrup and enhance to flavor with some almond extract. I didn’t know if it will come out good but it totally worked! I also made whipped cream frosting because it’s light and doesn’t require much sugar. Also, it would not take away from the cream soda flavor. 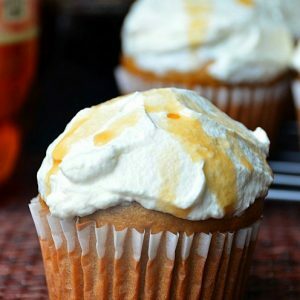 Delicious cupcakes made with a reduction of root beer for a stronger flavor and topped with whipped frosting flavored with a reduction of cream soda. Simmer 2 cups of root beer soda until it reduces to 1/2 cup. Also, simmer 2 cups of cream soda until it reduces to 1/2 cup. Set aside the syrups (refrigerate cream soda syrup). Preheat the oven to 350 and line the 12-cup muffin baking pan with cupcake liners. In a bowl of an electric mixer, beat eggs oil and sugar until well combined. Add the syrup, almond extract and vanilla extract. Mix well. Sift in the flour, salt, baking soda and baking powder. Mix, on low, until just incorporated. Add the root beer and mix until all incorporated. Separate the mixture between the 12 cups, filing them 3/4 of the way. Bake for 16-18 minutes, until the toothpick inserted in the center comes out clean. Cool the metal bowl and whisk attachment in the freezer for a few minutes. Make sure the heavy cream and cream soda syrup is cold as well. In a bowl on an electric mixer, combine heavy cream, cream soda syrup and vanilla extract. Start beating on low gradually increasing the speed to high every couple of seconds. Slowly add the sugar while the cream is whipping. Beat until stiff peaks appear. Keep in the refrigerator until ready to frost the cupcakes. Frost the cupcakes and drizzle some cream soda syrup on top. Everyone in my family loves root beer. I can’t wait to make these for them! These sound YUMMY! Cant wait to try them! Those look great! Years ago I found a root beer cupcake recipe and made it, but it just didn’t taste right. I pinning this one, so I can try it soon. Wow, this sounds like such a fun combo and my fiance would flip for these! Can’t wait to try these out. Yummy! 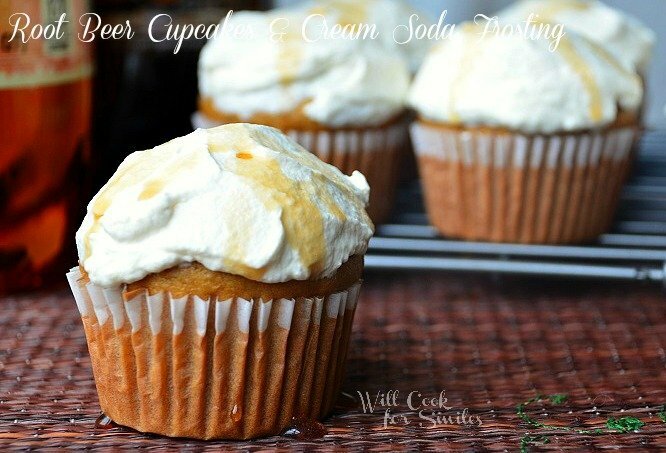 I recently made some root beer cupcakes that were delicious… I gotta make them again with this cream soda frosting! Great idea for a flavor combo! Just popped over from The Shabby Creek Cottage! What an awesome combination. Will pin this recipe and give it a try! Thanks for sharing. Hi, I’m going to make these for my husband’s birthday. Do you think I can do the cupcakes tonight and the frosting tomorrow? I have never reduced anything, is it easy to mess up? And finally, do you think I can leave out the almond extract? Is it essential? Neither one of us really likes that flavor. Thanks so much, and your photos are gorgeous. My husband was very excited when I showed him this recipe. I’m so sorry to reply so late. You can make the syrups ahead of time. It’s really not hard, just simmer on medium heat and it will take up to 30 minutes. Almond extract is pretty essential for he strength of flavor. If you don’t like almond, you can try to find a root beer extract. If you don’t want to use any extracts, the flavor of root beer won’t be very strong but it will still be good. I made these for my husband’s birthday and he LOVED THEM. We did skip the almond extract but the root beer flavor still came in, strong and perfect. He was truly amazed by their deliciousness. The reduction worked perfectly as well. I can’t thank you enough for the perfect treat for him. I’ll blog them this week & post the link so you can see how they turned out. Oh that is too funny! Thank you! Pinning this recipe. They sound amazing! Wow, I have never heard of these before! Very original, I will have to try them! So yummy! Stopping by from WHAT’S COOKIN’ WEDNESDAY? I was so excited at the prospect of these but they didn’t really come through as I dreamed they would. I followed the recipe EXACTLY and used A&W root beer to reduce. They were tasty cupcakes but they didn’t taste like root beer at all. If you’re going to make this, I’d suggest finding some root beer extract (which I couldn’t find) to make it taste more like you expect it to. Nice idea but it was a miss. So weird. I got the root beer flavor loud and clear without using extract! I’m sorry it didn’t come out, Laurie! I also got the root beer flavor pretty strong. I tasted cream soda frosting much stronger but it was clearly root beer cupcake flavor. Keep trying on the extract, may be try WalMart or baking store. Do you think the recipe will double okay? I think I’m going to give it a shot tomorrow, thanks! Can I use white or yellow cake mix? I have boxes if the stuff and wan to use them for my kids birthday party on Saturday. You can use a cake mix, sure. The main difference between yellow and white cake is one uses egg yolks and the other does not. My son now wants this as a cake for his birthday. Do you think it could be done as a layer cake? We all loved the cupcakes. I’m sure it could, Laurie. Just decide how big you want the cake and you may have to double the recipe. Thanks so much. Now to throw a wrench in the works he wants to reverse the flavors, so it’s a cream soda cake with root beer frosting! Would love your opinion, do you think that would taste good? His birthday is next week, the crazy kid. I’m sure it would be just fine, Laurie! Cream soda is a little more mild than rootbeer, so you would taste root beer a bit stronger since it will be dripped in syrup. If he loves root beer, he might like it much better tho! 🙂 Let me know how it works out! I will send you a link when I finally get a chance to blog it, but I made the layer cake yesterday! We stuck to root beer for the cake and cream soda for the frosting. It was a huge hit! I had to double the recipe and it took forever to make (because of the reductions) but everyone devoured it including the waiter at the restaurant where we had my son’s birthday. Thank you! The layer cake was a little heavy but nobody seemed to mind and the flavors came through beautifully. What brand of root beer and soda did you use? Are there certain ones that work better? Trista, I believe that I used A&W, it’s a pretty popular brand and my husband’s favorite. He liked Root Beer more that I do and he likes that brand. I don’t think that a brand would make too much of a difference though. This sounds absolutely delicious – I love root beer! Can’t wait to try them. Would love to receive your recipes via my email. Thank you for sharing. I made these for a friends party and the texture and flavorful of the cupcakes were AMAZING. They were moist and soft and have a very nice root beer flavor. I brushed the tops of them with a little more root beer syrup before frosting. This is such a wonderful recipe, and I’m so glad I happened upon your post. I just wanted to tell you how lovely the cupcakes turned out, thanks! I’m sorry these didn’t come out for you, Ori! I’ve never had it taste bitter before. I wonder if it was the kind of root beer you used. There are some brands taste different from others. That could have caused the bitterness. I used dads root beer. I have no idea why. My moms commebt was that they were really thick. But if you ate them with enough frosting it balenced well, and i liked it better than if we had just made vanilla cupcakes or something. Just found your website through a Pinterest link. Love it! As far as the root beer cupcakes, do I keep them in the refrigerator or can they set out overnight? I’m so sorry that I missed your question, Chris! You can keep the cupcakes out overnight, just cover them up so they don’t dry, but try to make the frosting fresh. If you are short on time, just refrigerate the frosting since it’s dairy based and add it to the cupcakes the next day.